Learning through play! 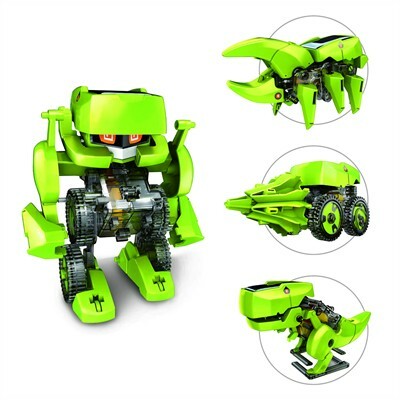 This kit easily transforms between one of four different modes; a walking Robot, a 6 legged walking Rhino Beetle, walking T-Rex with moving jaws and a moving Drill Vehicle with a drilling bit similar to a miner's driller! This transforming kit is completely solar powered with no requirement of any batteries. This kit will demonstrate the use of alternative energy at the same time create a toy that is fun to play with its possible four different transformations. Tool may be required is a diagnol cutter.